Okay, so I've been a bit MIA but all with good reasons. On May 7, I will officially be done with classes in grad school. I'm in the throws of finals while finishing up grading for my class I teach and keeping up with my research. On top of this all? Signing my first mortgage today! Oh hayyy grown up . . . sort of. Cute condo with a gas stove (yesss) in a lovely kitchen, two steps from a metro stop, and a great outdoor space that my kickball team is already reserving for barbecues. So forgive me in the months leading up to the move for not being too active in the kitchen, I'm going to be on a rampage to cook everything I own before leaving and it probably won't be too blog worthy. This pork, however, was delicious and definitely blog worthy. I didn't know too much about Diana Kennedy before this post, or for that matter anything authentically mexican cuisine wise. I love eating non-tex-mex mexican food in California (ohhh ceviche in Berkeley! ), but that was the extent of my knowledge. Diana Kennedy is referred to the Julia Child of mexican cuisine, amassing a huge wealth of mexican cooking techniques and history over 45 years. I do not have access to a lot of her typical ingredients, so I decided to take her banana leaf wrapped pork pibil and lightened it up and make it a little more Sarah-friendly. First, I used a pork roast I found for dirt cheap, both for cost and because I wouldn't know what to do with a 3 pound+ picnic. I grabbed a can of chipotle in adobo because even after searching in many a spots across DC I couldn't find annatto or dried chiles (any help would be appreciated). I didn't have banana leaves so I mashed up a little bit of banana for the marinade and wrapped the pork in foil. I made a quick avocado, cucumber, and mango salsa to cool down the spicy roasted pork for tacos. Everything can be found in your local grocery store (with a baller ethnic aisle), so get to it! First bring together the marinade. I used my immersion blender with the cup that it comes with to mix everything up, from the oranges to the bananas. I took about four large pieces of foil, enough to fully cover the pork and create a well sealed pouch, and added in the marinade. You can do this 6 hours to overnight, but I was impatient and marinated for 1 hour. Preheat the oven to 350 F. Put the wrapped pork in a oven safe pan with a high lid to catch any juices. I cooked the pork for about 45 minutes wrapped in the foil and then another 20-25 minutes with the foil open, until the pork reaches a temperature of 150 F or so. Carry over cooking while covered for 10 minutes will bring the pork to a safe temperature of 160 F. I didn't use a thermometer (on the list of tools to get) but I pulled the pork out when the roast felt firm to the touch. Slice up into chunks and put back into the cooked juices. Serve immediately. I used corn tortillas warmed up over the fire on my gas stove and topped with greek yogurt and a cucumber, mango, and avocado salsa . . . Chunk up the cucumber and mango into bite sized pieces. 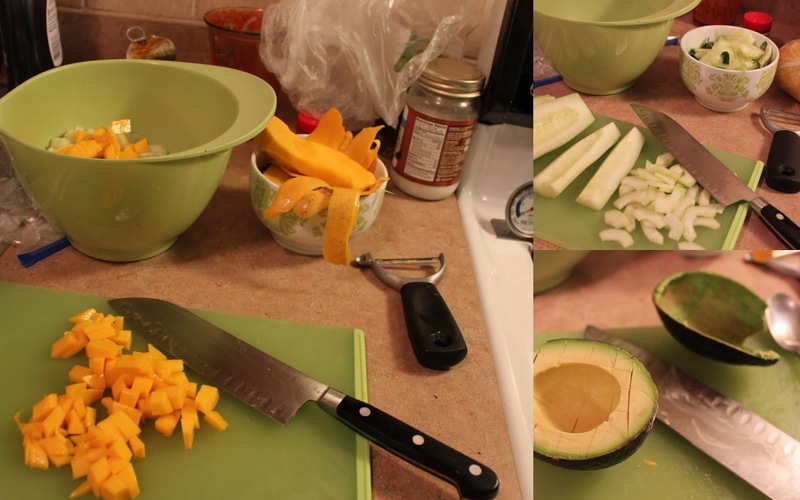 Cut the avocado into bigger chunks, to account for mixing. Add the onions, chipotles, and spices. Season with salt, pepper, and honey to your taste. Enjoy! The pork roast with the refreshing mango salsa is too tempting to resist. What a fun interpretation of Diana Kennedy's recipe!